Ezemonye L.I.N., Ikpesu T.O. and Ilechie I. The Latency and Reactivation of Temperature- Sensitive Mutants of Mouse Cytomegalovirus in Different Organs of Mice. Hazem Akel, Farouk Al-Quadan, Moh’d Al-Huniti, Suzan Al-Oreibi, Moh’d Ghalib and Sheerin Issa. 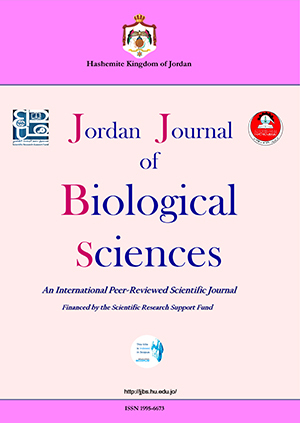 Effect of Allium sativum and Myrtus communis on the elimination of antibiotic resistance and swarming of Proteus mirabilis. 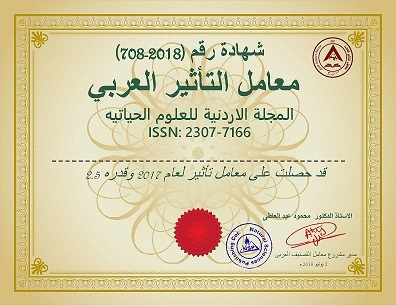 Variations of Heavy Metals Concentration in Suspended Matter and Physiochemical Properties in the Coastal Surface Water of the Gulf of Aqaba.